In tandem with Ireland’s development as a leading international financial services centre, Dillon Eustace has developed a dynamic team of lawyers representing international and domestic asset managers, investment fund promoters, insurers, banks, corporates, financial institutions, TPAs and custodians, prime brokers, government and supranational bodies as well as newspapers, aviation and maritime industry participants and real estate developers and investors. 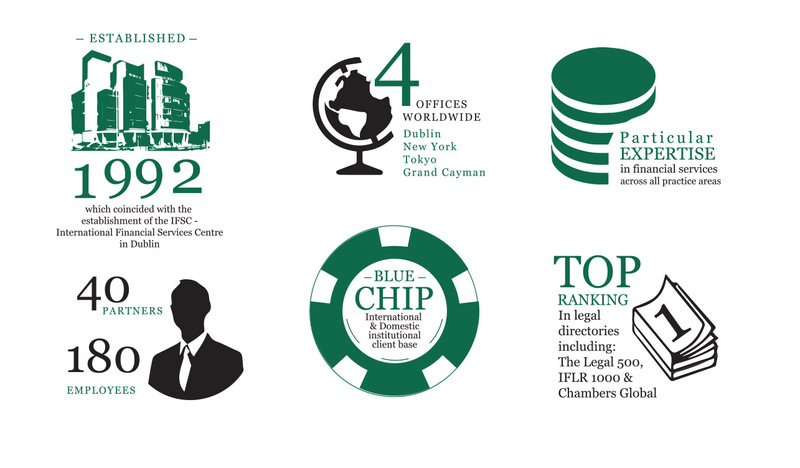 Headquartered in Dublin, Ireland, the firm’s international practice has seen it establish offices in Tokyo (2000), New York (2009) and the Cayman Islands (2012). We strive to develop our teams, to provide a sophisticated proactive service to our clients. We work to develop a comprehensive understanding of our clients’ business needs and to provide them with a bespoke service which is focused on meeting their requirements in an efficient, timely and cost effective manner. We hope that the information provided on this site assists you firstly, as well as introduces us and our services to you. Firm and individual partner endorsements appear over the following pages.